Hey guys I just received the Herbalizer desktop vaporizer today and I wanted to get up some pictures and share a quick overview of my initial thoughts. So first things first, the quality of everything seems extremely nice so far. I mean it ought to be for $599. Right? The Unit is a lot smaller than I expected it to be! It seems that the Herbalizer could be placed in the house a lot more inconspicuously than the Volcano or the CloudEVO. Update: 10/4/18 – Herbalize seems to have disappeared. 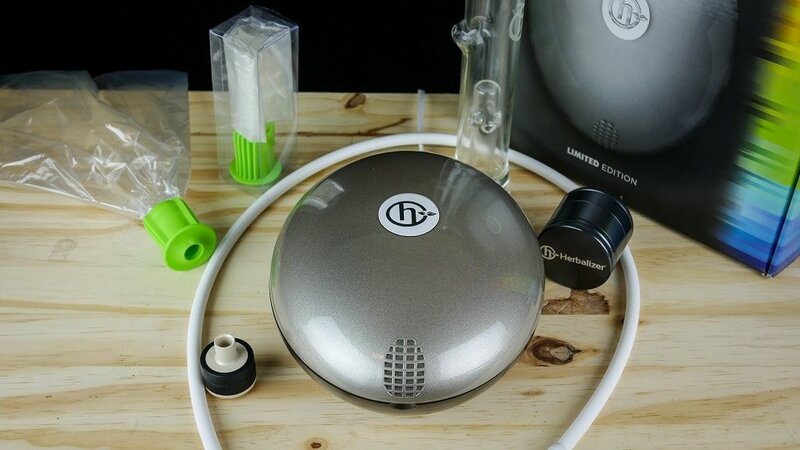 The website is down and no longer seems to be selling and/or supporting Herbalizer vaporizers. Be careful if you see them still for sale somewhere. Since the Herbalizer is shaped like a large oval it could pass for a humidifier or home speaker. The glass mouthpiece is very high quality, the whip mouthpiece is nice on the lips and the display is very easy to read/navigate. Everything works as described and I’m thoroughly impressed with the vapor quality this unit puts out so far, especially at the higher temps. With something like the Volcano the flavor really drops off as you go beyond 415f, with the Herbalizer I was surprised to still enjoying the flavor even up at the max temp of 445f. Operation – You can turn the unit on by opening the lid but the unit doesn’t begin heating until you select vaportherapy or aromatherapy. I haven’t tried the aromatherapy option and I’ll wait to give that a try until later. So from here I just select the vaportherapy option and then let it get to my preferred temp. You can change the temps via the plus and minus buttons located just below the screen. So far the temp buttons are my only complaint. They work just fine with no problems but the feel just isn’t quite right since the minus button is slightly indented, and the fan button is a bit wobbly. These are normally things that don’t matter too much, but since this is a very high priced vape I am going to mention everything. Heat Up – First things first, the heat up time is extremely fast! Pre-heat to 445 degrees Fahrenheit takes 10-15 seconds which is extremely fast for any vape and especially a desktop vaporizer. The Volcano, CloudEVO and Extreme-Q all take much much longer to reach temps. 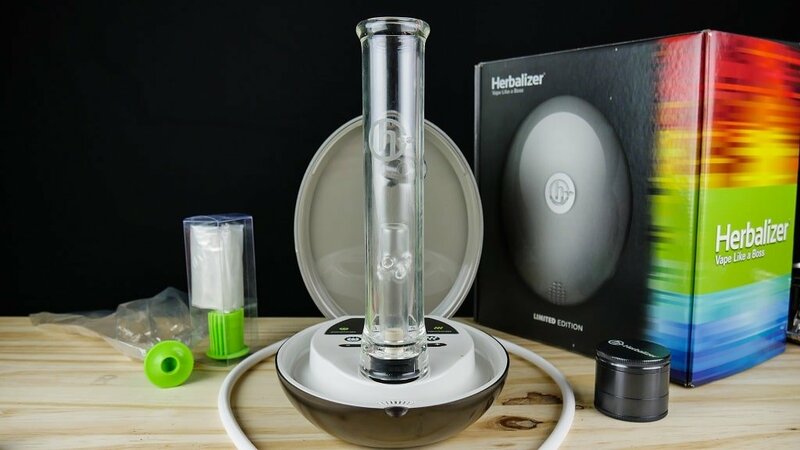 Glass – The Glass is the newest accessory to the Herbalizer and I have to say that I’m a big fan, especially with the fan assist. You hook up the glass piece, which is dry by the way (no water option), place your finger over the choke and start drawing with or without the fan assist (which is the middle button). When using the fan assist I just barely pull until the chamber starts to milk up and then match my draw to the fan speed. I turn the fan off a few seconds before I am done drawing. It provides simple, effective results and very clean tasting. Not hot or harsh. I’m excited to do some testing with both the CloudEVO and Herbalizer side by side and do some heads up comparison. The Herbalizer vs CloudEVO article will be in the works for sure. 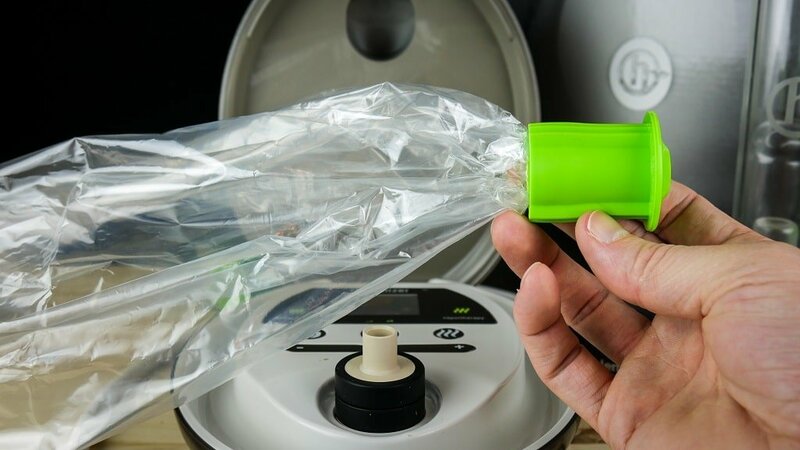 Bags – It will be interesting to see which units I prefer more for bags the Volcano or the Herbalizer after more testing. So far the bags definitely take longer to fill up than the Volcano bags and the Herbalizer valve system does not seem to be as good as the Volcano’s Solid/Easy valve systems. But the vapor quality from the Herbalizer seems quite a bit better than the Volcano so far, and it’s especially noticeable at the higher temps above 415f. While the slower bag fill time was a bit of a letdown, if you have to turn on both the volcano and the Herbalizer, the Herbalizer would still fill the bag faster due to the wicked fast preheat, the Volcano would only win if it was already turned on and preheated. Whip – The Whip is one of my favorite parts so far, especially because I can remove the mouthpiece and hook it up to a GonG. The whip by itself is also extremely easy to get smooth, tasty, cool vapor. The fan assist is much better than the Extreme-Q which is the only other fan assist whip vape I have used and requires no effort to get huge clouds if that’s your thing. I’ve definitely noticed a slight silicone taste in the whip on the first few uses but I’m guessing that will go away over time. I’ll be sure to keep an eye on that as I continue testing. Fan Assist – The fan assist option is really proving to be a nice feature so far. It’s much more powerful than the Extreme-Q and makes it easy to get large tasty hits. Be sure to check out my Instagram for daily vape pictures and videos. Summary – So overall my first impressions of the Herbalizer are very good. My only real complaints so far are obviously the price is high, the bag valve system isnt as nice as the Volcano, and the temp buttons aren’t as good as they could be, but I’m really enjoying this thing, and I am excited to fully test this beast out. I definitely felt like a kid on Christmas Day when this thing came in the mail today. 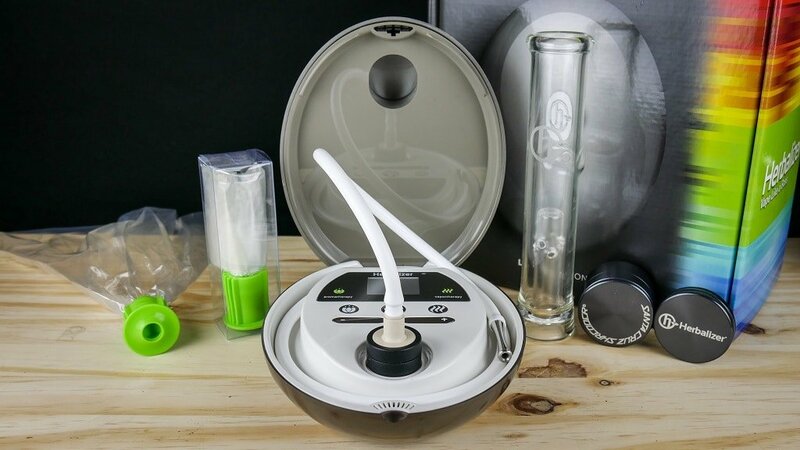 This is definitely a versatile unit and it has so many options and different temps to try out and not to mention the concentrate options….ahhhhh! I’m hoping to put out an article and a video shortly once I am finished fully testing. Stay tuned and thanks for checking out my vaporizer blog.